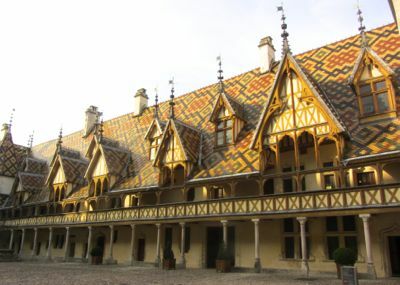 Built as a hospital for the poor in 1443, this beautiful building is one of the highlights of Beaune. 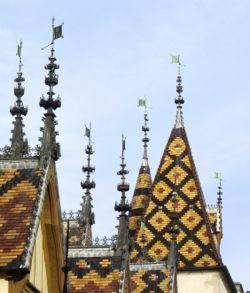 Many pictures of Beaune feature the lovely tiled roof of the Hôtel-Dieu, one of the most important sites in Burgundy and a symbol of the region (map). 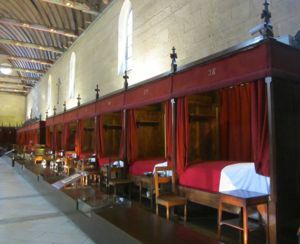 Built as a hospital for the poor in 1443 by Nicolas Rolin, Chancellor to the Duke of Burgundy, and his wife Guigone de Salins, it actually provided care until 1971, when a new hospital was built. Today's visitors can admire the beautiful structure and also many of the interior rooms, including the large and lovely Salle des Pôvres, or Great Hall of the Poor. The architecture is stunning, and displays in several rooms illustrate daily life for the patients and staff over the centuries. A map and an audio guide (included in the price of admission) explain the history of the Hôtel-Dieu. You'll see a pharmacy and a laboratory, as well as the kitchen where meals were prepared for the patients. Costume displays illustrate how the fashion in habits and nursing clothes have changed over the years. Displays of old medical instruments may make you a bit nervous, but fortunately they're behind glass. At the end, be sure to visit the beautiful 15th century tapestries and the Polyptyque of the Last Judgement, by Rogier van der Weyden (1400-1464), an amazing painting with a vivid portrayal of Hell. 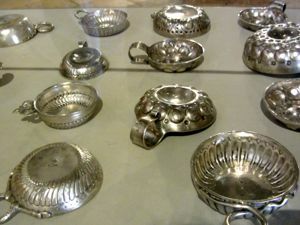 There is also a wonderful display of tastevins, or silver wine tasting cups. These were traditionally given to little boys in Burgundy at the time of their first communion or at weaning. Start'em young appreciating the fine wines of Burgundy! Although the visit is very impressive and you'll come away feeling amazed, perhaps even more amazing is that the Hôtel-Dieu has remained true to its mission for over five centuries, providing care and charity to those in need. What other institution can claim that? Over the years, a variety of legacies and gifts have led to the Hôtel-Dieu (or more formally Hôtel-Dieu des Hospices Civile de Beaune) owning a significant amount of vineyards. Each year since 1859, on the 3rd Sunday in November, a world-renowned wine auction is held, with all proceeds supporting the current hospital and the maintenance of the Hôtel-Dieu. The Hospices Civils de Beaune also includes a nursing school, helping it ensure high quality medical personnel. The Hôtel-Dieu is definitely a "must see" in Beaune. You can get a combination ticket that also covers the wonderful Musée du Vin and the Musée des Beaux Arts. It is also just across the street from the Place de la Halle, or market, so if you visit on a Saturday be sure to stroll through the market as well. Above, the Salle des Pôvres, Hôtel-Dieu. Below, Collection of tastevins, Hôtel-Dieu.